All purpose flour, as the name suggests, is white wheat flour that can be used for baking a wide range of products from bread, cake, pizza, biscuits, flat breads, and pastries just to mention a few. It is made from a blend of soft and hard wheat. The flour may be bleached with chemicals or aged naturally (unbleached). Bleached flour is banned in Europe and Australia. (Nigella.com). The protein content of all-purpose varies depending on the brand and the niche market. It mostly ranges from 10-13.3%. Most all-purpose flours have a protein content of about 10%. Some brands of Canadian all-purpose have a protein content of 13.3%. Some brands in the US have a protein content of 6.6% (White Lily). All purpose flours sold in the southern USA contain a higher proportion of soft wheats (less gluten), good for making light airy biscuits that are popular in the South. In contrast, flour sold in the northern states has a higher proportion of hard wheats (more gluten) good for making bread (The Wellness Encyclopedia of Food and Nutrition). Some states or governments require that white flour be enriched with iron and B-vitamins, thiamin (B1), riboflavin (B2), folic acid (B9) and niacin (B3). Some manufacturers also add calcium and vitamin D. If the flour is enriched, the label will say “enriched“ and the list of ingredients will indicate the minerals or vitamins, added. What are the ingredients in all-purpose flour? 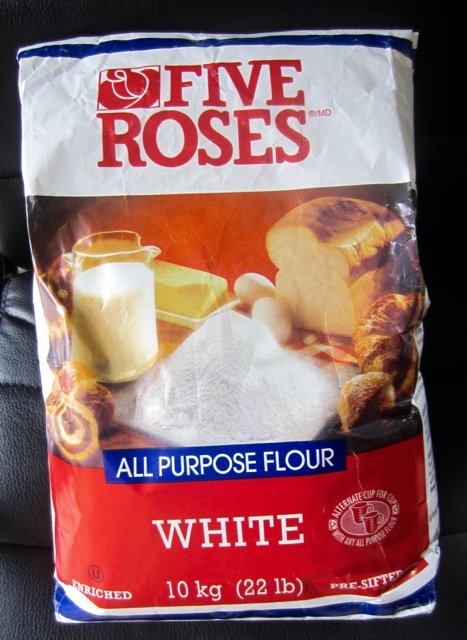 Here are the ingredients in Five Roses All-Purpose White Flour: Wheat Flour, Thiamine Mononitrate, Riboflavin, Niacin, Folic Acid, Reduced Iron, Ascorbic Acid, Amylase, Benzoyl Peroxide. 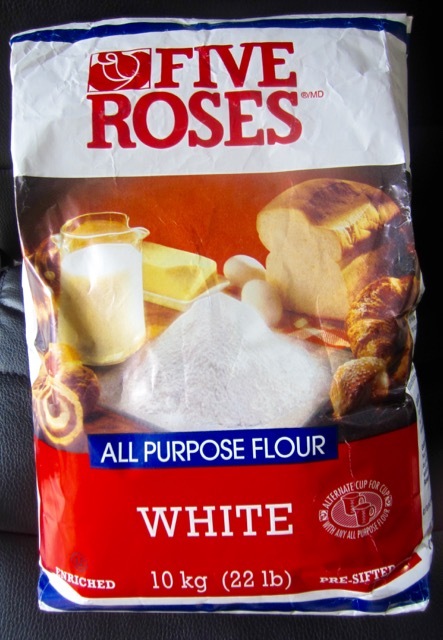 Here are the ingredients in Five Roses All Purpose Whole Wheat Flour: ascorbic acid, azodicarbonamide, amylase. Prev What is Corn Syrup? Next What is ham hock?